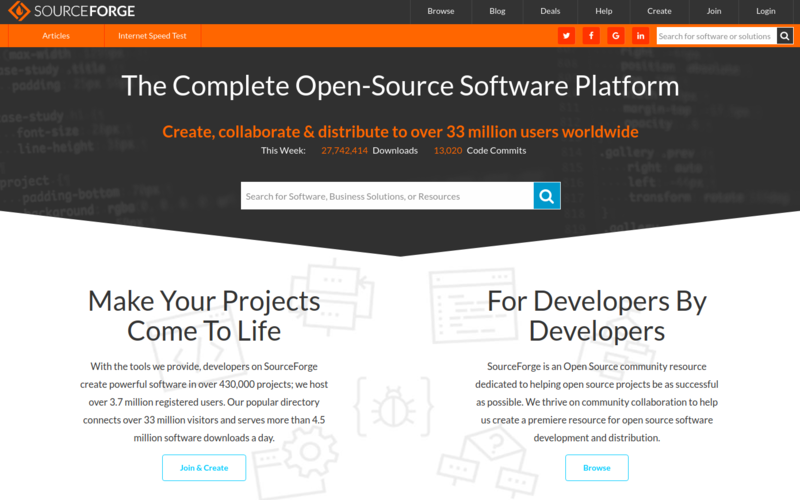 SourceForge, tired of being the forgotten GitHub alternative, has been busy redesigning its website. Normally such a cosmetic solution might seem a little underwhelming -- the phrase "putting lipstick on a pig" comes to mind -- but in this case it's a necessary step in the site's efforts to return to relevance, especially in light of changes that have already been made. "We really just wanted a clean but vibrant new design that could best showcase the 430,000 open source projects at SourceForge," Logan Abbott, a partner at BIZX and president of its SourceForge Media subsidiary, said. "We wanted it to be much easier to navigate for both developers and end users. I think for non-technical users, SourceForge is now the most intuitive open source software repository out there. The new design is also responsive, so it works well across all mobile devices." The newly redesigned homepage of the SourceForge repository website. For those who've forgotten -- or are too young to remember -- there was a time when SourceForge was the de facto top-of-the-heap online code repository, mostly for open source projects. History hasn't been good to SourceForge, however. In 2005 Linus Torvalds wrote and released the Git version control system, which led to the creation of GitHub in 2008, an online code repository that fit developers' needs to a tee. There was still room for SourceForge, however, as GitHub works great for devs but not so much for end users, which has always been SourceForge's strong suit. In September 2012 the site was sold to Dice Holdings, which shot itself in the foot when it began including proprietary ad-supported content in Windows downloads and began positioning deceptive "download here" ads in a way that confused users. Large software projects that had made SourceForge their home began finding other alternatives, starting when GIMP, the popular open source Photoshop alternative, very publicly left in late 2013, citing SourceForge as a bad actor. Dice created more negative PR for the site in June, 2015 when it was discovered it had declared GIMP's SourceForge page "abandoned" and had begun mirroring the project's official download site and inserting paid software offers within the downloads. Two other large projects that had left the site, security auditing tool Nmap and media player VLC -- once SourceForge's most downloaded project -- reported similar treatment. "[T]hey have moved all the Nmap content to their new page which only they control," Nmap's developer, Gordon Lyon, said at the time. "So far they seem to be providing just the official Nmap files (as long as you don’t click on the fake download buttons) and we haven’t caught them trojaning Nmap the way they did with GIMP. But we certainly don’t trust them one bit!" That led another large project, phpMyAdmin, to announce they were leaving the site less than a month later. The current owners bought SourceForge in January, 2016, and immediately began making moves to repair the site's reputation in order to turn it into a viable GitHub alternative. Free trials bundled in downloads and deceptive advertisements were deep-sixed within days. A few months later, the site began scanning hosted projects for malware, with some sites being flagged with a red warning badge next to the project’s download button. About a month after that, an internet speed test was added, contributing to the site's usefulness. 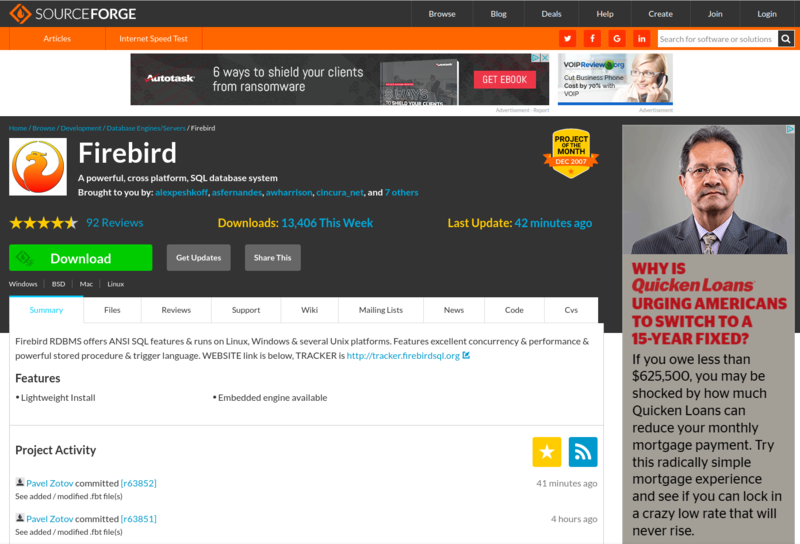 The project page for Firebird database on SourceForge's newly redesigned website. "I think most people would agree that the old design was quite dated," Abbott said. "We wanted a new design that looked more modern, and we also wanted to communicate change in general. It’s been just over two years since my company acquired SourceForge, but many people still don’t realize ownership has changed, and many bad parts of SourceForge have since been eliminated." A new design was definitely needed. The old design, which was unintuitive and difficult to navigate, had been around pretty much forever. The new interface is much more intuitive with fewer ads that are positioned less intrusively. Abbott has no pretensions about turning SourceForge into a GitHub killer, but thinks the site is well positioned for developers to use hand-in-hand with GitHub, which he sees primarily as a developers' tool and not well suited for everyday users looking to download software. "Our interface and discovery tools are by far the most intuitive for someone looking for software who is not a developer," he said. "If I told my grandmother to go to GitHub and download and install a piece of software, she’d find it quite difficult. That’s not the case with SourceForge." He also said this isn't the end of the work being done to make SourceForge more useful. For example, his team has developed a GitHub sync tool that will keep GitHub releases updated on SourceForge. Although already available for use, the tool is still a work in progress and will be able to sync full repositories later this year. "We’re super excited about the new design," he added. "Now that’s out of the way, we’re spending the rest of the year improving the developer tools and feature sets, as well as looking to create sync tools for other repositories."